In a stand mixer or mixing bowl, beat together the sugar and butter/margarine. Add the vanilla and then add the eggs, 1 at a time. Pour in the milk and beat on slow speed, as the batter is very liquidy at this point. Add the lemon juice and the lemon zest. Beat for just a few seconds, just long enough to mix it in. Add the flour, baking soda and baking powder and mix until batter forms. Then mix the poppyseeds. Finally, fold in the chopped strawberries. Pour the batter into regular size muffin tins and bake at 350 for 18-20 minutes, or until toothpick comes out clean. Note: The more ripe the strawberries, the better and sweeter they will be after they finish baking. 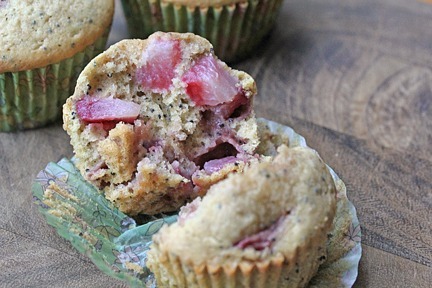 Unripe or semiripe strawberries will give the muffins a tangy flavor. Oooo….Yummy! I scored a great deal on strawberries yesterday and I think this would be a great recipe to use. Plus it would feed the lemon craving I’ve been having lately! There’s just about spring that makes me crave the lemon poppy seed combination – the strawberries just add to the yum factor! It looks delicious and easy to prepare and I love all kind of berries: strawberries, raspberries, blueberries. Oh my….GOODNESS. My 2 girls and I made these today (minus poppyseeds) and these are SO YUMMALICIOUS! We made a mistake and ended up making a double batch because no one was looking and too many eggs added to original batch…anyway, I didn’t have enough strawberries for a double batch and lucky I had a pint of blueberries in freezer so I added them as well. I ended up making a dozen and a half muffins and a large cake pan-will freeze the muffins. We will be making these again when berries come on sale….this is a winner recipe! I had to add about 50% to the baking time as the strawberries made them so moist they were almost uncooked in the middle. I also used 2T instead of 3T of the poppy seeds and it had plenty even that way. Great recipe–thanks.